Job after maternity leave - Check out the common issues faced by new moms and how to overcome them. Should working women continue to work after they have a child? This is an ongoing debate. A woman can choose between working part time or taking a break for some years if the circumstances are like that. However, sometimes, it’s not even an option. A single mother or if it’s financial necessity, a new mom has to pursue a job and look after her child/children as well. But, the question is, can a working mother be at as good at her job after maternity leave as she was before? You can’t answer it with a ‘Yes’ or ‘No’. A woman can be good at her job but she might experience certain issues. But, before discussing about them, let’s look at some statistics first. Moreover, among married-couple families with children, about 60% of these families have both working parents. According to US Census Bureau, about 83% single mother families are there with children less than 18 years. If you are a working mother, you’ll also like to know that nowadays, more mothers are cutting their maternity leave short. Some mothers are taking only about 10 days of maternity leave. As per statistical data published by National Center for health Statistics in 2013, about ⅔ US women are employed during pregnancy and about 70% of them report taking leave. Average maternity leave is for about 10 weeks, and about half of new mothers took only 5 weeks of maternity leave. About 16% of new moms took only 1-4 weeks of leave from job. Working mothers usually put aside quality time to spend with their family along with contributing towards a happy and positive environment in the family. By managing her time efficiently, she can maintain a perfect work-life balance to appreciate her worth and importance. However, they face some common issues, which, you - a new mom, might experience when you join back work after your maternity leave. Check out how to overcome issues faced by new moms when they join back. Issue: You can’t be the employee who reaches office first and leaves last. What to do: Have patience - Ultimately, it pays off. It is true that you can’t spend a lot of time at office. But, you can be a better coworker - in fact a better leader, since you are a mom. You don’t know how much your multitasking skills have improved. You have also become much more compassionate. All these will help to excel at workplace. Issue: You compare yourself with other working moms and try to stretch yourself. What to do: It is true that you need support from others to be successful by being a working mom, and the first support should come from you. At first, stop comparing yourself with others. Do not focus on what you wish you could do, but be happy what you’re able to do. If you’re positive, things will become much easier for you. Issue: You want to be a perfectionist as you used to do before. What to do: There is nothing wrong to be a perfectionist. However, you should try to complete your work by a deadline and not worry too much about being a perfectionist. Stop being judgmental and accept that there are days when you can’t be a perfectionist and that is how you balance life. Issue: You are worried about making important decisions as fast as you can. 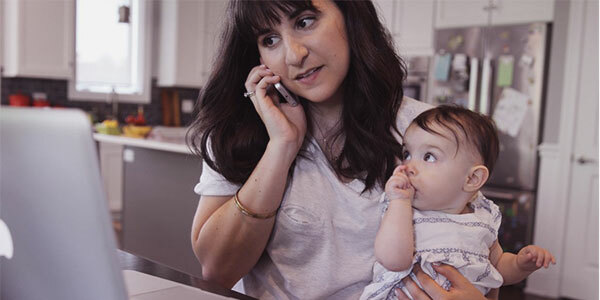 What to do: When you join work after your maternity leave, it’s not the right time to decide whether or not you’ll continue to work, or whether opting for part time is the right decision. Instead, give some time to settle into a routine. You need some time to adapt. So, don’t make any decision in the first few weeks. Give yourself some time and it’ll be easier for you to make the right decision. Issue: You think that you’re neglecting your child by joining back work. What to do: This is a common issue faced by working women. Instead of feeling guilty, be happy that you’re contributing to the family finance so that you can raise your baby/babies the way you want. Issue: You want a good support system. What to do: Try to have a quality support system, instead of looking for quantity. A single person can be a great help to you. Do not hesitate to take help from your in-laws if they are able to help you. Also, you can take help from your parents. A friend can also be a great help to you. When you have to attend a meeting, a friend can babysit your child. Moreover, it’s quite important for moms to support each other, because they can understand each other’s situation better. A simple thing - Sharing with each other and discussing can help solve many problems. How can women save household expenses and implement happiness in life? Before making the decision to join or quit job after maternity leave, just ask yourself - You need to be a role model for your child and if you quit without even trying, what example will you set for your son /daughter? Page loaded in 1.063 seconds.